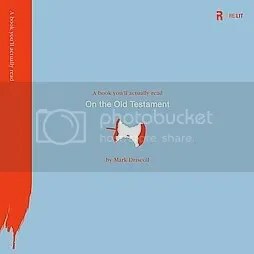 I sped through On the Old Testament (A Book You’ll Actually Read) by Mark Driscoll this past week, and read the whole thing (slowly) within a couple of hours. What is the central message of the Old Testament? Opening line introduces the hero, God. Throughout the pages of the Old Testament God is revealed. In the closing line of the New Testament Scriptures we’re reminded that God who is the hero of the whole story is embodied in Jesus. Thus, Jesus Christ is the true hero of the entire Bible. Jesus Himself taught us that the Old Testament was primarily about Him (John 5:37-39). Following His resurrection, Jesus opened the OT to teach others about Himself (Luke 24:27, 44-45). Jesus’ own words about Himself as the central message of the OT are pointedly clear (Matthew 5:17-18). Jesus was completely aware He was fulfilling the promises of the OT. Simply put, when the OT is correctly interpreted you will find it’s about Jesus as God, our Savior, the object of our faith, forgiver of our sins, and giver of eternal life. To correctly interpret the OT you will need to connect its verses, concepts, and events to Jesus. David and other kings who prefigure Jesus as the King of kings. We also see people in the OT who perform various kinds of service analogous to the service that Jesus performs perfectly. Unlike the first Adam, Jesus is the Last Adam who passed His test in the garden and in doing so imputed righteousness to us to overcome sin imputed to us through the first Adam. Jesus is the true and better Abel who, although he was innocent, was slain and whose blood cries out for our acquittal. When Abraham left his father and home, he was doing the same thing Jesus would do when He left heaven. When Isaac carried his own wood and laid down his life to be sacrificed at the hand of his father Abraham, he was showing us what Jesus would later do. Jesus is the greater Jacob, who wrestled with God in Gethsemane and, though wounded and limping, walked away from his grave blessed. Jesus is the greater Joseph who serves at the right hand of God the King, extends forgiveness and provision to those of us who have betrayed Him, and uses His power to save us in loving reconciliation. Jesus is greater than Moses in that He stands as a mediator between God and us, bringing us the New Covenant. Like Job, innocent Jesus suffered and was tormented by the Devil so that God might be glorified, while his dumb friends were no help or encouragement. Jesus is a King greater than David, who has slain our giants of Satan, sin, and death, although in the eyes of the world he was certain to face a crushing defeat at their hands. Jesus is greater than Jonah in that he spent three days in the grave and not just a fish to save a multitude even greater than Nineveh. That’s just a sample – there’s a lot more good stuff in this book. Driscoll nails the reason behind the existence of the Old Testament: it’s all about Jesus! That’s a conclusion I drew for myself a long time ago. There are four books in the ‘A Book You’ll Actually Read’ series. One on God, one on Church Leadership, one on The New Testament, and one on The Old Testament. I own them all and have found all to be helpful – especially the on on The Old Tesament. Direct, to the point, and you can read the whole thing in one sitting. Tagged a book you'll actually read, central message of the old testament, driscoll, jesus, jesus foreshadowed in the old testament, Mark Driscoll, mars hill church, Old Testament, On Church Leadership, On Church Leadership (A Book You'll Actually Read) by Mark Driscoll, On the New Testament, On the New Testament (A Book You Will Actually Read), On the Old Testament, On the Old Testament (A Book You'll Actually Read) Mark Driscoll, on who is, ot, purpose of the old testament, who is god? Great thoughts…. Very helpful resources…..